I’ve written before (see below) that words matter ... especially to association executives. 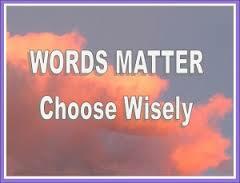 Our words – whether written or spoken – greatly influence our success as well as the success of our associations. carefully craft the words you’ll use for your association. Edit what you've written ... and, before you send it, have it proof read!